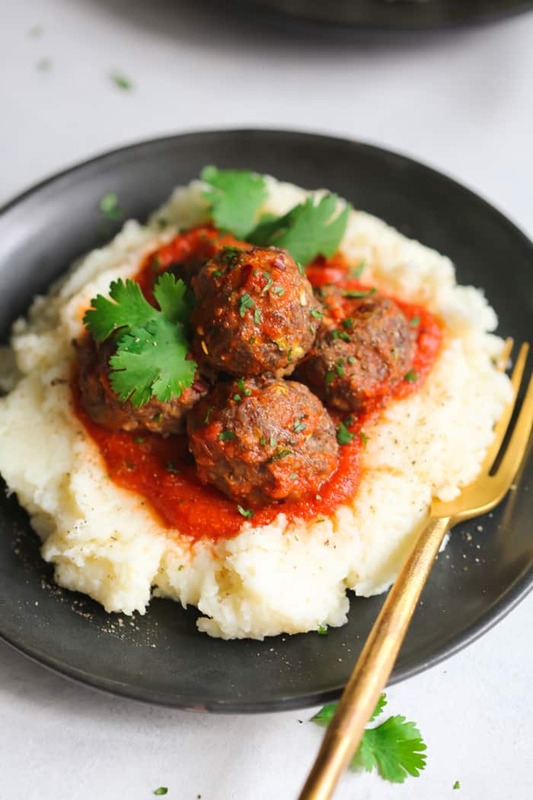 This Low-carb Turkey Meatballs with Mashed Cauliflower is a delicious meal for your low-carb diet. The meatballs are made with parmesan cheese and almond flour. The mashed cauliflower has a perfectly smooth texture that you and your family will love. I just came back from Boston and I can’t say enough how much I love that city. It’s so beautiful, charming, and vibrant! I love the fact that it’s a small city, but at the same time, feels big. It has everything that a metropolis can offer! People are so friendly and there are lots of things to do. And I can’t forget to mention about the lobster rolls. O.M.G. What is that? AMAZING! We went to visit my auntie, uncle, and cousins for 8 days and they loved to be with Thomas, my 15 months old adorable boy. They live in a house with a huge backyard, perfect for an energetic little boy like my son to explore. Thomas loved the green space they have there, especially the neighbor who has a horse farm. How fun is that?! We could even give food to the horse. So cool! My auntie had a BBQ party at her place and she also made some traditional Brazilian food that was so good! Thomas and his cousin Sophia played a lot and had fun together. I was very excited to see my son so happy like that. The weather wasn’t very good but we had few days of sunshine and blue sky. I really can’t complain. The trip was great and I can’t wait to go back there again. 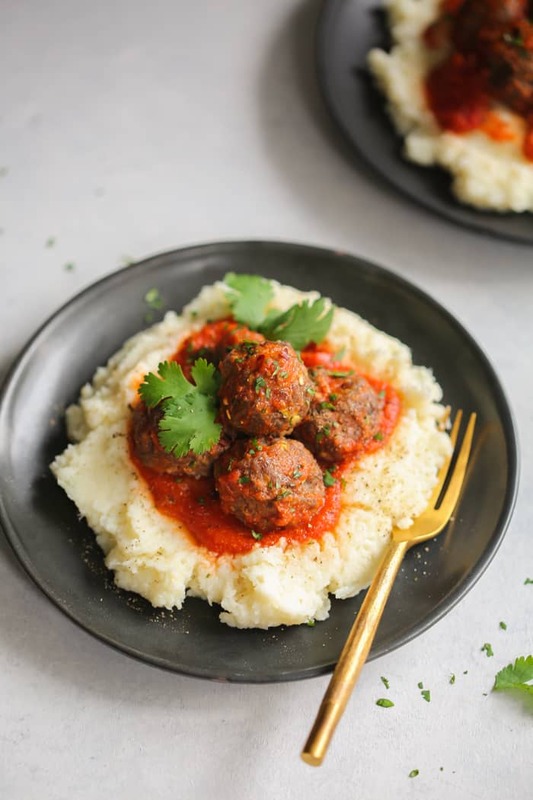 Now I’m back to share with you this delicious and easy to make Low-carb Turkey Meatballs with Mashed Cauliflower. I have to say this is a meal you can eat without feeling guilty. It’s loaded with good-for-you ingredients and it’s very flavorful. The mashed cauliflower is insanely good and I can even say that it’s just as tasty as the traditional mashed potatoes. Believe me! It’s packed with flavors from the cauliflower, parmesan cheese, butter, and garlic powder. This time I steamed (instead of boiling) the cauliflower and I also made it using a hand blender, avoiding the soupy texture that some mashed cauliflower recipes can have. These two tips created a perfect creamy texture to my mashed cauliflower! 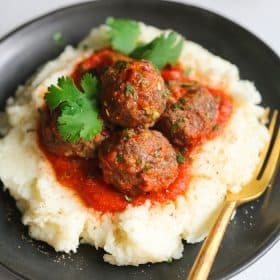 The meatballs are also great and they’re low-carb because instead of breadcrumbs I used almond meal (affiliate link), making it low-carb and gluten-free! It sounds weird, but it’s actually really flavorful. I also didn’t fry or sauté them. I decided to bake to save some calories. These are seasoned very well and they are very tender and juicy. These meatballs are also good in the freezer for up to six months. When you are ready to eat them, just toss them in a simmering sauce or heat in the microwave. Preheat oven to 400°. Grease a baking pan with cooking spray or olive oil then set aside. In a large mixing bowl, add all the ingredients for the meatballs and mix well. Place the meatballs on the baking sheet, separating them a little bit so they can bake evenly. Steam the head of cauliflower by filling a large pot with about 2 cups of water and place a steamer basket in the bottom. Bring the water to a boil. Meanwhile cut the cauliflower head up into large pieces and remove the stem from the cauliflower. Cover the pot and steam until the cauliflower is fork tender (6-8 minutes). When the cauliflower is completely smooth, add butter, parmesan, garlic powder, salt, and ground black pepper. Stir well to combine. To serve: Serve a big scoop of mashed cauliflower with 3 turkey meatballs and marinate sauce on top. 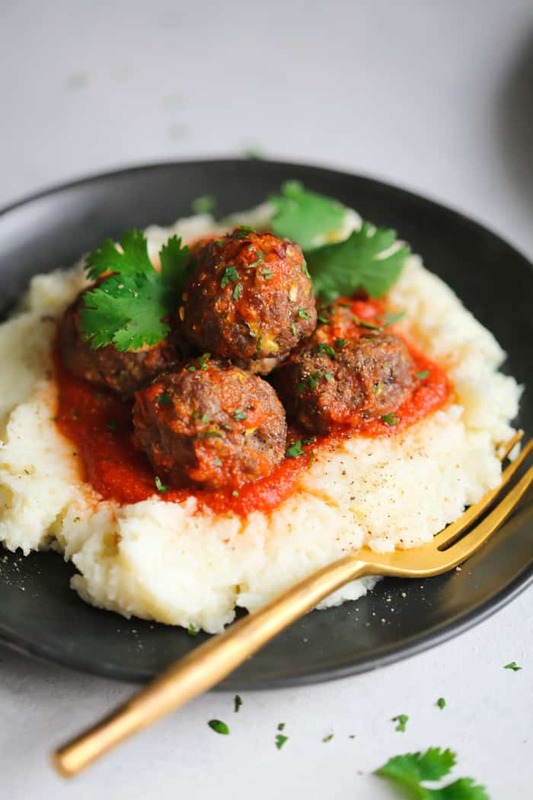 So, I hope you enjoy this Low-carb Turkey Meatballs with Mashed Cauliflower recipe and try to make some in your own kitchen today. If you like this recipe, please share with your friends and family. Do you want to taste more? Subscribe to my newsletter and follow Primavera Kitchen on Twitter, Pinterest, Google+, Instagram, and Facebook for all delicious recipes updates. As always, I really appreciate you stopping by. I am ALL about the meatball life lately! These look absolutely amazing. Perfect as a poppable snack, party app or main dish! Your trip sounds so fun – I love that your little one got to feed a horse!! 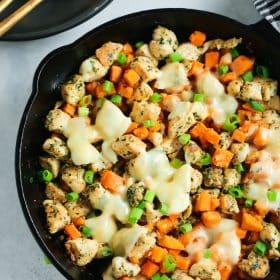 I also love this lightened-up version of classic comfort foods! Yum! Malinda, what didn’t work exactly? The meatballs or the mashed cauliflower? This sounds great!! What is a great substitute for almond meal? You can use breadcrumbs if you are not on low-carb/paleo/whole30 diet, or Panko for gluten-free. 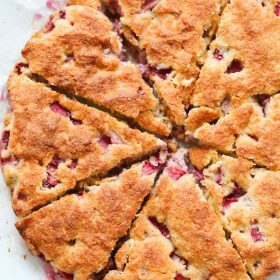 You also can use flaxseed flour. If using panko would I use the same amount of panko as almond flour? Yes it’s the same amount. I made the meatballs, I wasn’t paying attention and used 1 lbs of Turkey instead of two, 2 eggs, 1/3 cup or so of flax meal, 1/4 cup parmesan, chopped onion and the seasonings. I had never used the flax meal before. I was scared they were going to be too wet cuz the meat mixture was really loose, but they turned out so good and moist!!! They were delicious, I pan fried them in olive oil till browned up, then simmered in a quick marinara sauce. I didn’t make the mash, but am looking forward to trying that out soon. Thanks for the recipe!!! And myvmistake actually worked out. Haha!